Thank you for the overwhelming responses to my PunchTab sponsored juicer giveaway! As I tweeted excitedly yesterday, nothing could make me happier than to give a CR reader the gift of green juice. I forgot to mention in my post that this is a special giveaway in that it’ll be up for a whole month, so please keep the entries coming! The PunchTab entry key will remain open on my sidebar, for all to see. Please share word! Today, we’re back to the usual business here at CR: food. 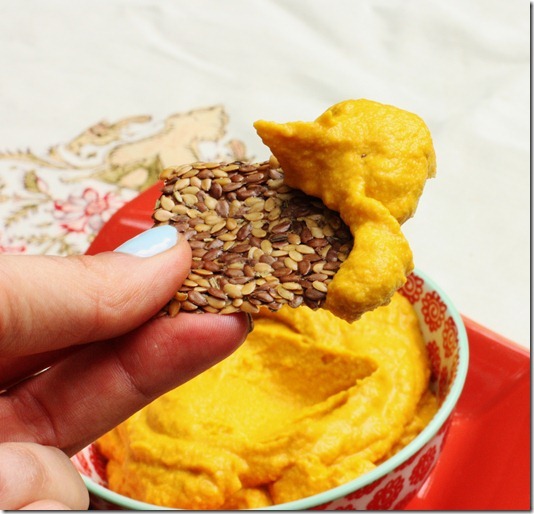 It’s been a while since I made a non-hummus dip/spread; when things get busy, I tend to revert to stuff that’s really tried and true. Lately, however, the impact of over 5 weeks of repetitive, uninspired food is getting to me. 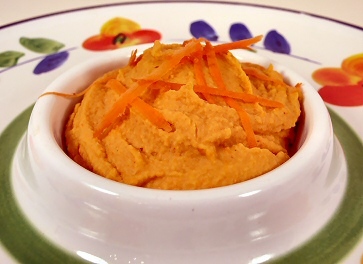 During my 48 hours of summer last weekend, I made a couple of old favorites and new dishes: granted, nothing fancy, but one of the highlights was this delicious carrot “mousse,” which I whipped up in about 15 minutes flat. 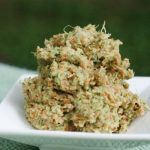 I had a few sources of inspiration for this recipe. 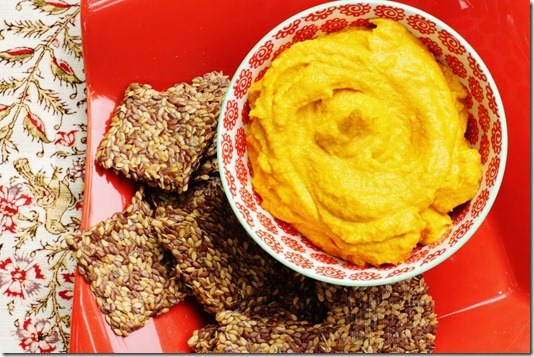 One was Ricki’s wonderful holiday carrot pate, made with silken tofu. 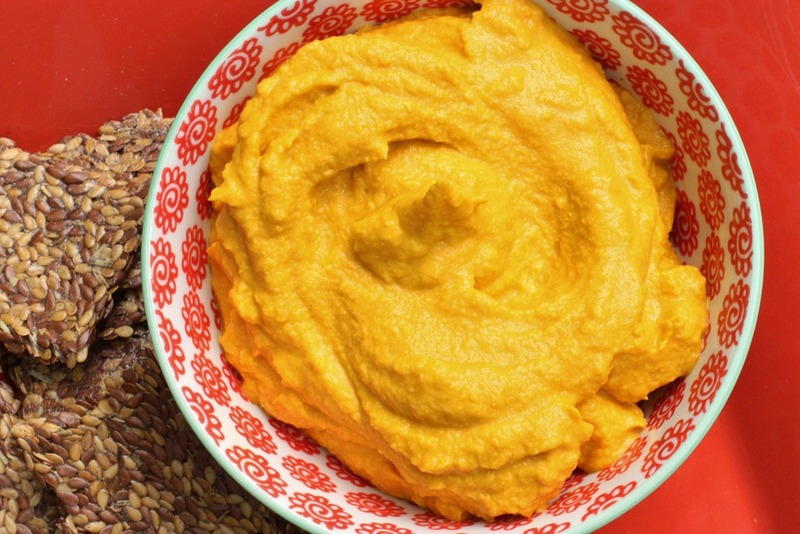 This dish is far prettier than what I made, but the idea is the same: a light, savory carrot mixture for dipping or spreading. The other was Susan’s shiny happy hummus, which was actually one of my very first homemade hummus recipes. 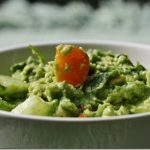 I made this, as I did many of Susan’s recipes, in the year or so before I switched to a plant based diet, as I was hesitantly dipping my toe into the waters of vegan food prep. It didn’t disappoint! Light, sweet, and tasty, this is one of my favorites. Boil baby carrots or regular carrots till tender. Drain and place them in a high speed blender with other ingredients. Blend, using the tamp attachment and as much water as you need to get things moving (I used a little less than 1/4 cup) till smooth. If you’re using a food processor instead, first grind the pumpkin seeds till they’re in a fine meal. Then add remaining ingredients and blend, using a few tbsp of water if needed, till very smooth. 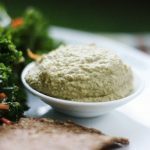 Adjust seasoning to taste, and serve! 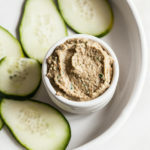 It’s a perfect recipe for spreading on crackers, but it’s also very nice as a spread in raw sushi rolls, as a dip for romaine lettuce, zucchini or cucumbers, or as a creative substitute for mayonnaise (or veganaise!) in sandwiches. I hope you enjoy it as much as I did! Before I go, I wanted to mention a special upcoming event. 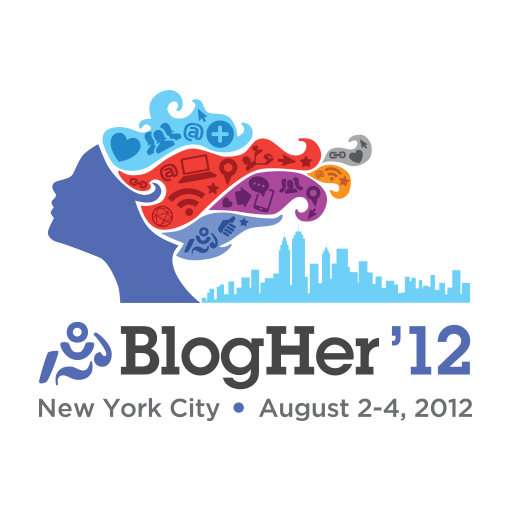 I’m sure that many of you are going to Blogher 2012–or that you’ve at least heard about it! What you may not have heard of is Blogher’s HealthMinder Day, which is a special day devoted to helping you get expert health information and learn about the latest online tools and gadgets to manage your own total wellness, and that of your loved ones. Speakers will include Terry Waters, Elisa Camahort Page, Roni Noone, and me! The panel I’m presenting on is called “Dedication vs. Obsession,” and it should be a really illuminating look into the fitness/healthy living realm. Over the weekend, I want to get some CR reader feedback on this topic, so please start pondering it! On that note, it’s back to the grind. Happy hump day! Previous Post: « Win a Breville Juice Fountain Plus! A Giveaway From Punchtab. This looks awesome, Gena, and I’m sure I’ll make it this week. Is there a chance you could post a recipe for those crackers, too? They look like the crackers of my dreams! I was about to race to comment and say what about the crackers!?!? Glad I checked first. They LOOK amazing! I can be patient for beauties like those! 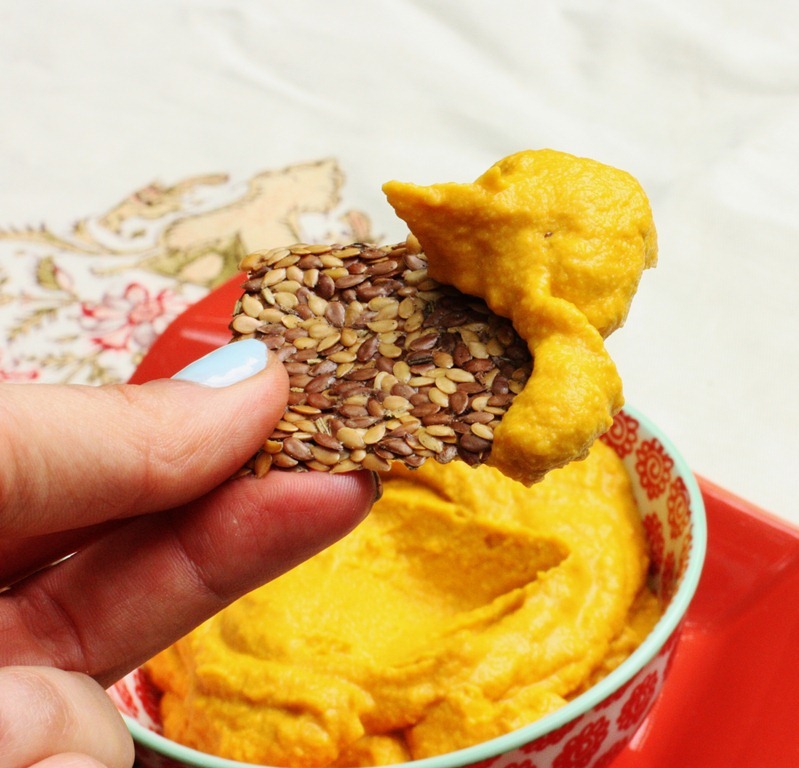 perfect thing to get me out of a hummus rut. and good for carrot season! Those crackers look amazing too!! Did you make those as well? See the above, in response to my first comment :)! That sounds wonderful! Beautiful photograph, too. Hey Kimberly! I’m working in the recipe as we speak. It’s not blog-worthy yet, but soon, I hope. golden deliciousness! yum yum yum. And congrats on the PunchTab giveaway 🙂 Juicer.. awesome! Gena this mouse look perfect! Can’t wait to try it. As for the panel discussion, you know my story! If you need any quotes for anything, just let me know. Jealous you’re going to to BlogHer! I went to BlogHer Food in June & it was really illuminating. It’s always a good thing to meet people in real life. Hope you have fun, & the panel discussion sounds like it will be a good one. (I believe I met Roni at BlogHer Food). I’m liking the carrot/miso/pumpkin seed blend. I make mixtures like this for sushi. Nice to see you suggested that! That’s a really loaded, but interesting, panel topic. I’m sure it will generate some thought-provoking points. I think you used the perfect word, “illuminating.” Looking forward to hearing about it. Carrots <3 Love those little orange beauties, and I bet they taste wonderful when pureed with some lovely little pepitas! 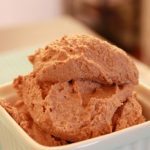 This looks wonderful, I adore the flavor combo and pate, so I need to try this soon! Thanks! That looks fantastic, Gena! I love the addition of dates and miso! Yum! 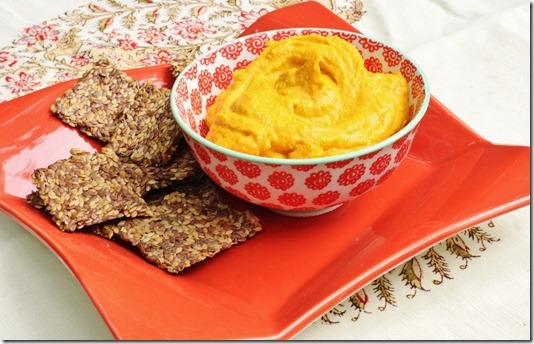 I have tried this appetizer as said and now it is one of my favorite. Thanks!